And that includes cluster bombs, an explosive that’s been outlawed by 119 countries. The long national nightmare that was the 2016 presidential election is finally over. Now we’re facing a worse terror: the reality of a Trump presidency. Donald Trump has already promised to nominate a segregationist attorney general, a national security adviser who is a raging Islamophobe, a secretary of education who doesn’t believe in public schools, and a secretary of defense whose sobriquet is “Mad Dog.” How worried should we be that Gen. James “Mad Dog” Mattis may well be the soberest among them? On how many countries is US ordnance falling at the moment? Some put the total at six; others, seven. For the record, those seven would be Afghanistan, Iraq, Libya, Pakistan, Somalia, Syria, and, oh yes, Yemen. The United States has been directing drone strikes against what it calls Al Qaeda targets in Yemen since 2002, but our military involvement in that country increased dramatically in 2015 when US ally Saudi Arabia inserted itself into a civil war there. Since then, the United States has been supplying intelligence and mid-air refueling for Saudi bombers (many of them American-made F-15s sold to that country). The State Department has also approved sales to the Saudis of $1.29 billion worth of bombs—“smart” and otherwise—together with $1.15 billion worth of tanks, and half a billion dollars of ammunition. And that, in total, is only a small part of the $115 billion total in military sales the United States has offered Saudi Arabia since President Obama took power in 2009. The photographs are devastating: Tiny, large-eyed children with sticks for limbs stare out at the viewer. In some, their mothers touch them gently, tentatively, as if a stronger embrace would snap their bones. These are just a few victims of the famine that war has brought to Yemen, which was already the poorest country in the Arab world before the present civil war and Saudi bombing campaign even began. UNICEF spokesman Mohammed Al-Asaadi told al-Jazeera that, by August 2016, the agency had counted 370,000 children “suffering from severe acute malnutrition,” and the UN World Food Program (WFP) says 14.4 million people in Yemen are “food insecure,” seven million of them—one fifth of the country’s population—“in desperate need of food assistance.” Before the war began, Yemen imported 90% of its food. Since April 2015, however, Saudi Arabia has blockaded the country’s ports. Today, 80% of Yemenis depend on some kind of UN food aid for survival, and the war has made the situation immeasurably worse. The nutrition situation continues to deteriorate. According to WFP market analysis, prices of food items spiked in September as a result of the escalation of the conflict. The national average price of wheat flour last month was 55 percent higher compared to the pre-crisis period. The day before the US election, Ismail Ould Cheikh Ahmed, the UN’s envoy on Yemen, described the situation this way: “People are dying…the infrastructure is falling apart…and the economy is on the brink of abyss.” Every time it seems the crisis can’t get any worse, it does. A recent Washington Post story describes such “wrenching” choices now commonly faced by Yemeni families as whether to spend the little money they have to take one dying child to a hospital or to buy food for the rest of the family. Casualty estimates vary, but the World Health Organization says that, as of October 25th, “more than 7,070 people have been killed and over 36,818 injured.” As early as last January, the UN High Commission for Refugees reported that 2.4 million people (nearly one-tenth of the population) were already internally displaced—that is, uprooted from their homes by the war. Another 170,000 have fled the country, including Somali and Ethiopian refugees, who had sought asylum from their own countries in Yemen, mistakenly believing that the war there had died down. Leaving Yemen has, however, gotten harder for the desperate and uprooted since the Saudis and Egypt began blockading the country’s ports. Yemen shares land borders with Saudi Arabia to the north and Oman—the only Arab monarchy that is not part of the Saudi-led coalition—to the east. That “check” from Washington did at least include the bombs used in the funeral attack. 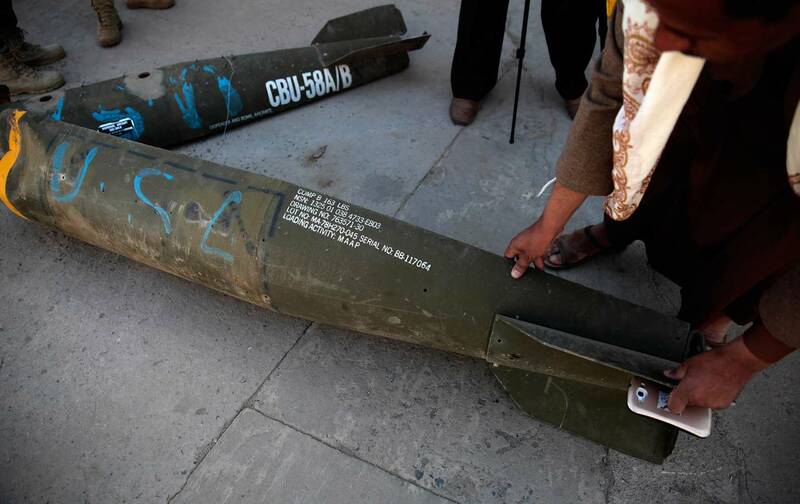 According to HRW’s on-the-ground reporters, US-manufactured, air-dropped GBU-12 Paveway II 500-pound laser-guided bombs were used. Why is Saudi Arabia, along with its allies, aided by the United States and, to a lesser extent, the United Kingdom, fighting in Yemen? That country has little oil, although petroleum products are its largest export, followed by among other things “non-fillet fresh fish.” It does lie along one of the world’s main oil trading routes on the Bab el-Mandeb strait between the Suez Canal at the north end of the Red Sea and the Gulf of Aden in the south. But neither Saudi nor US access to the canal is threatened by the forces Saudi Arabia is fighting in Yemen. During the Arab Spring in 2011, the Houthis supported a successful effort to oust President Saleh, and as a reward, according to al-Jazeera, that same General Mohsen gave them control of the state of Saadra, an area where many Houthi tribespeople live. Having helped unseat Saleh, the Houthis—and much of the rest of Yemen—soon fell out with his Saudi-supported replacement, Abdrabbuh Mansour Hadi. In January 2015, the Houthis took over Sana’a and placed Hadi under effective house arrest. He later fled to Saudi Arabia and is believed to be living in the Saudi capital Riyadh. The Houthis for their part have now allied with their old enemy Saleh. These days it’s not just American bombs that are landing in Yemen. US Special Operations forces have landed there, too, ostensibly to fight Al Qaeda in the Arabian Peninsula, or AQAP, the local terror outfit that has been expanding its operations amid the chaos of the war in that country. If anything, the air war has actually strengthened AQAP’s position, allowing it to seize more territory in the chaos of the ongoing conflict. In the ever-shifting set of alliances that is Yemeni reality, those US special ops troops find themselves allied with the United Arab Emirates against AQAP and the local branch of the Islamic State, or ISIS, and also, at least temporarily, with a thriving movement of southern Yemeni separatists, who would like to see a return to the pre-1990 moment when there were two Yemens, north and south. In the beginning, the White House claimed that the special ops deployment was temporary. But by June 2016, The Washington Post was reporting that “the U.S. military now plans to keep a small force of Special Operations advisers in Yemen…for the foreseeable future.” And that has yet to change, so consider us now directly involved in an undeclared land war in that country. Compared to the horrors of Iraq and Syria, the slaughter, displacement, and starvation in Yemen may seem like small potatoes—except, of course, to the people living and dying there. But precisely because there are no US economic or military interests in Yemen, perhaps it could be the first arena in Washington’s endless war on terror to be abandoned. I vividly recall a political cartoon of the 1980s that appeared at a moment when Congress was once again voting to send US aid to the Contra forces fighting the Sandinista government in Nicaragua. Having witnessed firsthand the effects of the Contra war there, with its intentional military strategy of attacking civilians and public services as well as its use of torture, kidnapping, and mutilation, I found those Congressional debates on sending money, weapons, and CIA trainers to the Contras frustrating. The cartoon’s single panel caught my mood exactly. It was set in the cloakroom of the House of Representatives. Suspended from each hanger was a backbone. A blob-like creature in a suit could just be seen slithering out of the frame. The point was clear: Congress had checked its spine at the door. In fact, in every war the United States has fought since World War II, Congress has effectively abdicated its constitutional right to declare war, repeatedly rolling over and playing dead for the executive branch. During the last 50 years, from the Reagan administration’s illegal Contra war to the “war on terror,” this version of a presidential power grab has only accelerated. By now, we’ve become so used to all of this that the term “commander-in-chief” has become synonymous with “president”—even in domestic contexts. With a Trump administration on the horizon, it should be easier to see just what an irresponsible folly it’s been to allow the power of the presidency and the national security state to balloon in such an uncontrolled, unchecked way.